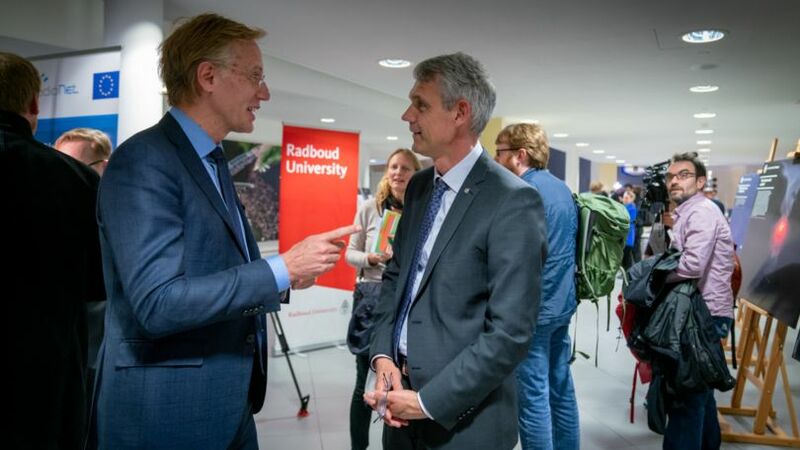 Robbert Dijkgraaf admired the results that Heino Falcke and colleagues presented today in Brussels. The director of the Institute for Advanced Study in Princeton and honorary doctor of Radboud University alluded to a Nobel prize for the project. What do you think of this discovery ? Why is this discovery so important for science? ‘These are the turning points that we have talked about for a hundred years. Do black holes really exist? I would compare this discovery with the first detection of atoms, after people had talked about this for many years. Finally, here is is the the proof: they really do exist. Does Heino Falcke deserve a Nobel Prize? He laughs. ‘I think the committee in Sweden should start thinking very seriously about awarding prizes for major scientific collaborations. It is a shame that administrative aspects around the prize (only three people can receive the prize so who should be chosen?) are still a consideration.